Note: Using fresh corn? Shuck and clean 6 to 8 ears of fresh corn. Bring a large pot of water to a boil. Add the corn and cook for 4 minutes. Remove from the water. When cool enough to handle, use a sharp knife to cut the kernels from the cob. Melt the butter in a large saucepan over medium-high heat. Add the onion and cook until soft and translucent, about 5 minutes. Add the flour and cook, stirring constantly for one minute. Stir in the sour cream and salt until blended. Remove from the heat. 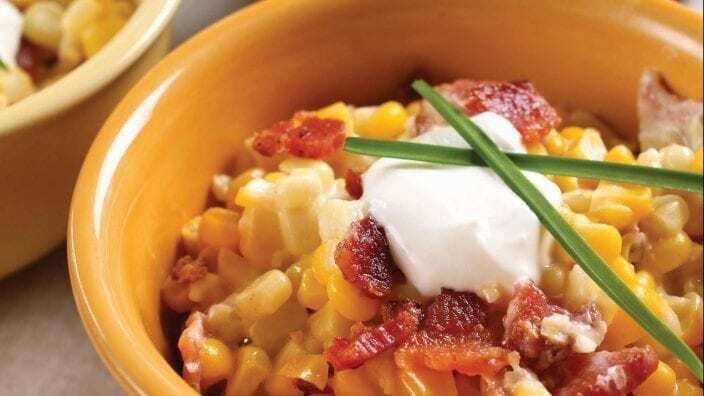 Add the corn and half of the bacon. Pour the mixture into the prepared 3-quart casserole. Top with the remaining bacon. Bake for 30 to 35 minutes or until the top is lightly browned. Cool slightly before serving.